Over three decades ago with the simple and pure philosophy of always staying “true to nature” and always asking himself “WHAT’S NEXT?” founder Charles Arena has grown from his original 500 square-foot flower shop into an 11,000 square-foot fully furnished design empire of organic luxury. With a thriving retail environment, a successful highly sought-after floral and event décor service and an ever-expanding roster of interior design clientele, the Arena’s lifestyle has transformed into a unique design language that is distinctive and recognized throughout Rochester and the Finger Lakes Region. Charles’ childhood passions for all things from the earth and his esteemed work ethic have honed his refined and far-ranging design aesthetic. 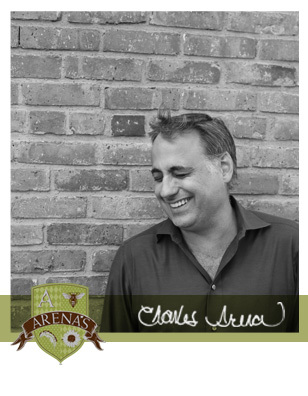 With a curator’s depth of knowledge about all things elegant, understated and serene, Charles has composed and tailored the Arena’s “Organic Luxe” lifestyle. With the support of his talented and dedicated team, deep-rooted relationships with high-end artisans and contractors within the community and afar, while collaborating with loyal clients, Charles continues to explore the limits of time-honored design that is nature infused and employed in a contemporary and fresh way.